Welcome to our ACIM Mexico Community page! Below is a newspaper article about David and our Mexico community which appeared in the Guadalajara Reporter, Aug 24th 2017! Learn more about our Mexico community by visiting our acim-mexico.info website. On that website, click “Events” in the menu bar to see our calendar of upcoming ACIM Mexico Community events, and to sign up for our mailing list. Published: August 24 2017. Written by Carol Kaufman. Combined with the low cost of living, open-­mindedness, welcoming environment and large population of English speakers, it’s no wonder that many practitioners of the spiritual path, A Course in Miracles, are choosing Lakeside as their new home. 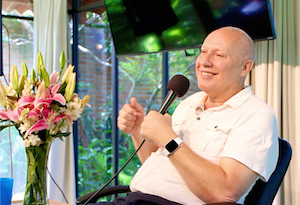 One of these practitioners is David Hoffmeister, international speaker, author and teacher of A Course in Miracles (ACIM). Several years ago, Hoffmeister was part of a group that bought a large home in Chapala and turned it into a major ACIM center for gatherings, workshops and events. 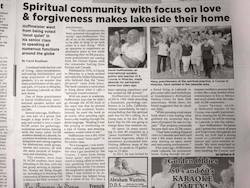 Joining with the many other ACIM students already at Lakeside, he envisions hundreds of students living here and coming together for celebrations, study groups, movies and concerts, all with the same purpose of forgiveness and extending love. This summer, more than 30 ACIM students have been relocating to the area, with the last group arriving in September. Homes are being bought up, including a co-­housing-­like community of homes atop a hill in Riberas del Pilar, to house 34 practitioners. “Our ACIM community has been scattered throughout the world,” says Hoffmeister. 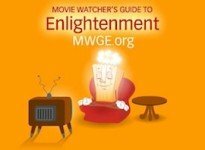 “For all of us to be neighbors and to be able to drop in on each other is a rare thing.” With an openness to experience an alternative place to live while enhancing their ACIM practice, most practitioners are coming from the United States; with the remainder hailing from Europe and Canada. David Hoffmeister, an international speaker, author and teacher of A Course in Miracles, made lakeside his permanent home four years ago. Hoffmeister was a shy child who was voted “most quiet” in his senior class. Hoffmeister discovered ACIM in 1986 while attending a humanistic psychology conference in La Jolla, California. 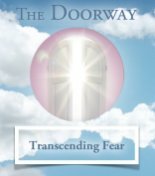 Almost immediately, he had a strong feeling that this spiritual path was his life’s calling. As a young man in his late 20s, he knew that his life was going to change from that moment on. He spent 26 years traveling to over 40 countries as a “peace troubadour.” In 2002, he visited Argentina, where 14 translators accompanied him. Visiting different areas of the country, he spoke at 19 gatherings in 19 days. In 2013, he was invited by a friend living at Lakeside to give some talks and workshops at Guadalajara’s Attitudinal Healing Center for their 20th anniversary. While there, the friend suggested that he check out Ajijic. Many practitioners of the spiritual practice, A Course In Miracles, have settled in the Lakeside area. “While perusing a real estate book where I was staying, what grabbed my attention was a piece of property for sale in Chapala.” That property eventually became their new ACIM center. Four years ago, Hoffmeister made Lakeside his permanent home. Going through the permanent residency process feels to him like a clear symbol of his commitment to live in Mexico and work closely with the Lakeside ACIM community. James Twyman, another dedicated teacher of the Course, was equally instrumental in creating the ACIM center. Next month, he will be moving to Lakeside to join the others. Expats aren’t the only ones embracing this spiritual path. 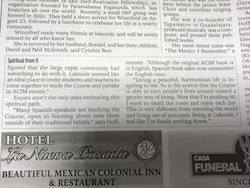 “Many Spanish-­speakers are studying the Course, open to learning about new ideas outside of their traditional beliefs,” says Hoffmeister. “Although the original ACIM book is in English, Spanish book sales now outnumber the English ones. For more information about the ACIM Mexico Community, see acim­-mexico.info.